SPRINGFIELD (October 13, 2015) – Equality Illinois’ expanded statewide strategy takes shape this week with the appointment of Peoria native Marcus Fogliano as the organization’s Central Illinois-based field fellow and the opening of the new Equality Illinois Springfield field office. The office, at 601 W. Monroe Street in Springfield, will be the Central Illinois base for the state’s oldest and largest advocacy organization for lesbian, gay, bisexual and transgender Illinoisans. Its opening on Thursday, October 15 will be celebrated at a reception for Central Illinois officials and LGBT and allied advocates. In addition to Fogliano, other Equality Illinois staff members will work out of the the office when in Springfield, including CEO Bernard Cherkasov, Director of Public Policy Mike Ziri, and Director of Field Operations Patty Dillon. Equality Illinois, which has always focused on the needs of the entire state, announced the expanded statewide strategy last August as a way to more comprehensively serve LGBT Illinoisans in those parts of the state where stronger connections to policy, education, advocacy and support services are needed to ensure full equality. The expansion also provides more opportunities for Equality Illinois to engage with allies throughout the state. Fogliano will be part of the organization’s field operation. 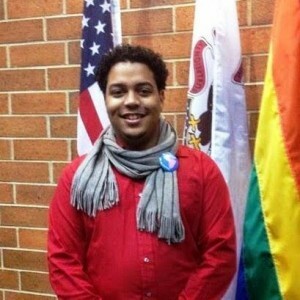 “With their knowledge of Central Illinois and his experience in LGBT advocacy, Marcus will help us educate the public in the region about the rights we enjoy as LGBT Illinoisans and also hear the challenges faced in trying to have a lived equality at home, at work, at school, and everywhere else in their communities,” Dillon said. Fogliano–a founder and currently the president of Peoria Proud, a community-based organization that encourages and supports diversity and equality throughout the Peoria metropolitan area–will also work part of the time out of Peoria for some of his field work for Equality Illinois. Fogliano’s other service includes being a board member at FamilyCore, co-chair of the Peoria County Reproductive Health Work Group, and a commissioner for the City of Peoria Advisory Committee on Police Community Relations. “As a Central Illinoisan through and through I am ecstatic to be joining Equality Illinois in the new Springfield office. For years LGBTQ resources have been few and far between outside of the Chicagoland area. I am looking forward to building stronger relationships with existing groups and looking at how to support their growth, and working with communities to fill the gaps where safe and affirming resources and spaces are not present,” Fogliano said. The expanded statewide strategy is being made possible in part by the support of the Abe and Ida Cooper Foundation. The balance of the project’s cost will be funded by a portion of Equality Illinois’ cash reserves which have been built through prudent financial management and maintained specifically for such reinvestment. Part of that statewide strategy is connecting with strategic community partners, with the first one being the Phoenix Center, Springfield’s LGBT community center. The work of the Equality Illinois field office in Springfield will include building relationships with groups and individuals, training and motivating activists, and engaging and facilitating educational, outreach, and other opportunities and programming for LGBT organizations throughout Central and Southern Illinois.